Just recently I was working on a project where I had to build a SSAS ROLAP cube on top of a badly built data mart. Badly built in this case meant one where we encounter multiple referential integrity (RI) issues. Most importantly, the designers ignored the very basic principle that all dimension keys for each row must be present in the respective dimension tables. When in MOLAP mode, SSAS checks for such mismatches during processing. However, when a partition is in ROLAP storage mode, we don’t get a notification that anything is wrong and the cube processing operation succeeds. This situation has some consequences during execution time and I will try to illustrate those in this post and show a solution. Before I begin, I must say that if it wasn’t for Akshai Mirchandani’s (from the Microsoft SSAS dev team) and Greg Galloway‘s help, I would have probably spent quite some time figuring out what is happening. Thanks to them the problem got solved quickly and I got to understand the reason for what is happening. 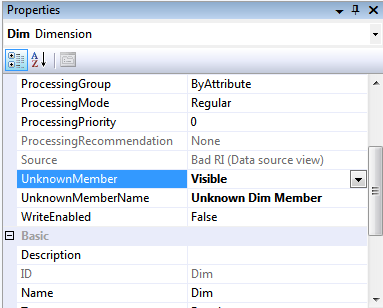 We can see that SSAS has executed one SQL query retrieving data from the fact table. Nothing unusual thus far. 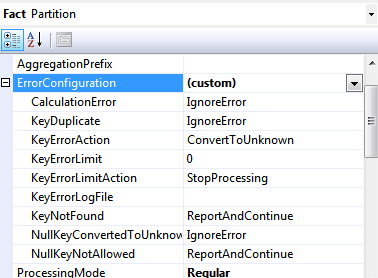 SSAS runs multiple queries which result in errors. In this case we can see four of these ExecuteSQL events. All of them are followed by an error in a ReadData event. 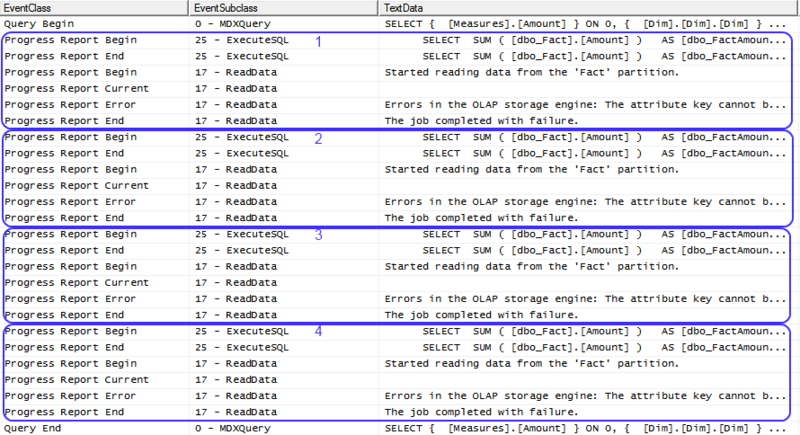 In this particular case we can see only four ExecuteSQL events. In the real-world, this scenario can get multiple times worse (in my case we saw 4667 queries run against the relational database in a few minutes) leading to a really significant drop in performance. So, what is happening? According to Akshai, SSAS encounters an error while dealing with the results from the initial SQL query and is trying to recover by sending more queries. In some cases this can result in getting the error in the result set only for some cells. It does not matter whether the UnknownMember is Visible or Hidden, as long as it is not None.